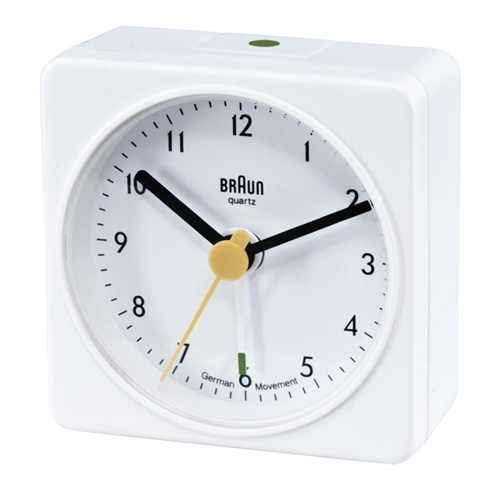 Braun BNC002 WHWH White Alarm Clock. Braun clocks. Alarm clock. Braun BNC001 range in White. Travel alarm clock by Braun. A practical modern design icon! This iconic travel alarm clock was designed in 1971. Dietrich Lubs designed this now iconic clock for Braun, while Dieter Rams was Head of Design for the company. This super compact Braun alarm clock is the perfect travel alarm clock since it stands only 2.2" tall, compact enough to take anywhere. While primarily used as a travel clock, this clock also works very nicely on the desk. The Braun BNC002 Quartz travel alarm clock features a clear crisp crescendo alarm signal and a quiet quartz mechanism with German movement. It has an easy to read minimalist dial layout, inherent to the Dieter Rams motto "less and more". The alarm switch is large and easily operated. No need to worry about a ticking sound either, this Braun alarm clock features a silent German precision movement. One AA battery will last over one year (included). A pared down, very small but reliable alarm clock, it has no snooze function, but a clear crisp crescendo alarm, and runs on one AA battery, many say, for a solid year.